The Drop Back is a 40 foot custom sport fishing boat with a 12 foot beam. She was constructed in the Florida Keys by a long time boat builder that knew what both Florida Keys fishing captains and their customers liked in a Florida Keys charter fishing boat! The result was a strong, stable, sleek, beautiful charter boat with a large interior for comfort and a giant cockpit for plenty of fishing room! As good as the original design was we took it a step further. The Drop Back's crew and customers deserve nothing but the best so our Florida Keys custom charter boat is equipped with the finest Furuno electronics, Simrad navigation and beautifully designed interior furniture. She is built for speed with her new, almost silent twin 450 Cummins turbo diesel engines so you'll reach the Florida Keys offshore fishing grounds well ahead of the rest of the fleet! 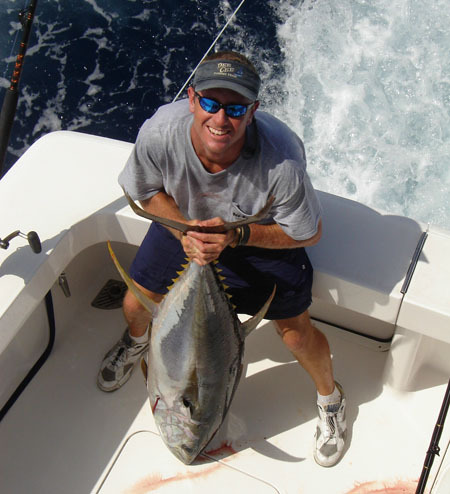 Once we reach Islamorada's offshore fishing grounds, the Drop Back's courteous and professional crew will ensure you catch your trophy fish by deploying nothing but the best tournament grade fishing tackle. You will love the wide assortment of meticulously maintained Shimano conventional and high speed jigging combos and world famous Diawa Black Gold Series spinning tackle. 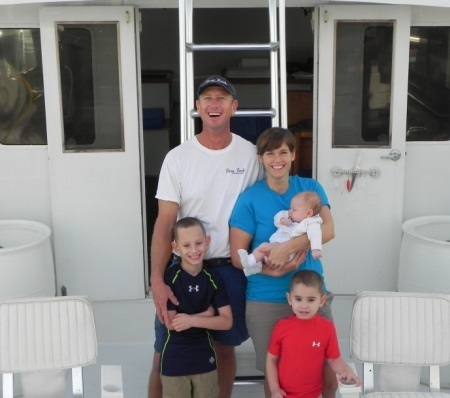 Enough about the charter boat - let's go offshore fishing in the beautiful Florida Keys! Hi, I'm Captain Jon Reynolds, proud husband and father of three. I would like to take this time to better acquaint you with myself and invite you to come fishing aboard the Drop Back with my crew and I in the beautiful Florida Keys. Aboard the Drop Back we pride ourselves in aggressive fishing, while HAVING FUN and staying patient with all of our customers. Our family moved to Miami when I was 8 years old and I immediately fell in love with fishing. After-school activities included fishing, fishing, and more fishing. My dad bought our first boat that year and soon every weekend was consumed with offshore fishing from Miami to Islamorada. My passion for fishing soon led to my first job at Burt's Place Bait and Tackle at the age of 11. The knowledge I learned over the next 4 years from the local captains that visited the shop was applied to our weekend offshore fishing trips. The flood gates were opened. I spent evenings tying knots and throwing nets to prepare myself for my first job as a mate, which I landed in 2001 at Holiday Isle Marina. After fishing during the day, I spent my evenings studying Chapman's Book of Seamanship to prepare myself for getting my USCG Captain's License, which I attained in 2002. My career as a fisherman has taken me on an exciting ride. I have been a part of many victorious tournament crews from Islamorada to Bermuda and beyond and love sharing my extensive knowledge and experience with all anglers - children and adults - who share my same passion. I love taking time out to teach my cousins, nieces, nephews and my own children to fish and welcome young anglers of all ages aboard the Drop Back.